Born and raised in Quebec, now with two kids of my own in French Immersion, I wanted to create an original CD that would be fun for kids and serve as a valuable resource for Teachers. The songs are upbeat and current…they cover 95% - 100% of the monthly vocabulary used in French Immersion grade one in Ontario and are suitable for all primary grades. 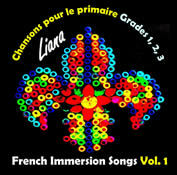 This CD is also suitable for English students that begin core French in grade 1 or 4. The bonus accompaniment tracks provided at the end make it easy to use at concerts. Please see the free lyric sheet downloads on this site for the complete vocabulary list. Have fun! French is a beautiful language…full of life…and this CD was made with great joy! 12. - 22. BONUS Accompaniment tracks! TO PARENTS AND KIDS: Learn French together through music by playing it in the car and at home. Have fun!